After completing my pension rollover analysis and having the funds completely transferred to my new Rollover IRA, I began to execute my plan of building out a collection of REIT holdings (plus one BDC). Initially, I planned to write up a detailed analysis of each purchase as I had done with my recent buy of EPR Properties. Unfortunately, a business trip and family obligations have derailed that plan and therefore I thought it would be best to recap the basket of REITs that I bought as part of one summary. Before diving into the details of the recent purchases, I thought it would be worthwhile to remind you about the background and a few thoughts that have influenced these purchases. After leaving my prior employer, I received notification that I was fully vested in the pension plan and could either defer the payment to the time that I reach full retirement age, take an immediate reduced pension payment, or receive a lump sum disbursement right now. If you read my analysis, you will know that I chose the latter option. That left me with a decision on what to invest in once the rollover completed. As my dividend growth investing portfolio is held in a taxable account, one of the sectors completely unrepresented was REITs–as it is recommended to hold those in tax-advantaged accounts if possible. With the REIT sector having made nice gains since the overall sector decline in the early stages of 2018, I had to acknowledge that some of my preferred positions might not be as great a value now as they were earlier in the year. However, given that I am currently unable to continue adding new capital to my IRAs, I had to decide between holding the funds where one of my desired positions was slightly over-valued or taking advantage of time in the market and steaming ahead. Again, I opted for the latter. Eyes wide open that this may not be the ideal scenario, however as my FIRE plans have not accounted for this money at all, losing a bit on the total return to begin generating the passive dividend income was a trade-off that I was comfortable making. When the dust finally settled, I had added one business development company (BDC) and nine REITs to my portfolio. Below I will recap each of the purchases along with a few pertinent highlights for each. Main Street Capital (MAIN) :: When it comes to BDC’s, MAIN is a market leader and has historically traded at a premium to NAV as compared to other options. However, that premium has been well-deserved as this is a very well-managed company. With their monthly dividend payments and dividend yield of 5.86% at time of purchase, my purchase of 50 shares will add $117.00 in forward dividend income. Sabra Health Care REIT Inc. (SBRA) :: Sabra Health Care has a 7-year history of paying increasing dividends with a dividend yield of 7.64% based on $1.80 payout per share. I made two purchases of SBRA, as I added a small amount after my initial purchase when the price dipped a bit more. In total, I purchased 53 shares that will add $95.40 in forward dividend income. Iron Mountain (IRM) :: Those that work in a large office may be familiar with Iron Mountain, as one of their primary segments of business is secure document storage and destruction. They also provide data centers, cloud services, and storage for more unique items such as artwork. They have an 8-year history of increasing dividends with a yield of 6.47% at time of purchase. My 82 shares will add $192.70 in forward dividend income. EPR Properties (EPR) :: You can read a more detailed analysis of my EPR purchase to understand more about the company, however my purchase of 45 shares will add $194.40 in forward dividend income. Uniti Group Inc. (UNIT) :: Uniti Group is focused on the acquisition and construction of communications infrastructure such as fiber, wireless towers, and ground leases. UNIT does not have a history of increasing dividends as I typically require, and therefore this is definitely a more risky holding whose adjusted funds from operation (AFFO) narrowly cover their dividend. However, at a robust 12.31% dividend yield, I was comfortable taking the risk. My 50 shares will add $120.00 in forward dividend income. Realty Income (O) :: The analysis from my initial Realty Income purchase still holds true, and I took this opportunity to make two more transactions–adding 40 more shares that will add $106.00 in forward dividend income. This now brings my total position to 71.236 shares. STORE Capital (STOR) :: STORE Capital, as their name fashions invests in and manages Single Tenant Operational Real Estate. They have over 2,000 properties across 49 states, and similar to UNIT do not appear on the Champion, Contender, and Challenger lists. They do however have a 4-year history of dividend increases with ~7% growth over recent years. My purchase of 30 shares will add $39.60 in forward dividend income. Simon Property Group Inc. (SPG) :: SPG is working on a 9-year history of dividend increases and has had a very respectable double-digit dividend growth over the last decade. There is risk with SPG as they invest in the retail space, specifically large malls. However, their tenants tend to be premier, top-end establishments and therefore don’t tend to suffer the same vacancy issues in lower tier malls. They maintain an A credit rating and have a respectable AFFO payout ratio of 59%, and while I would have liked to see the dividend yield a little closer to 5%, my purchase of 10 shares at 4.41% yield will add $80.00 in forward dividend income. STAG Industrial (STAG) :: As the name implies, STAG invests in industrial properties with over 72M square feet of space in their portfolio. They have an 8-year history of increasing dividends, however their dividend growth has been slowing considerably. STAG is another monthly dividend with a 5.05% dividend yield at the time of purchase. My 50 shares will add $71.00 in forward dividend income. W.P. Carey Inc. (WPC) :: W.P. Carey is one of the largest diversified net lease REITs with a portfolio consisting of industrial, warehouse, office, and retail properties. They have a very solid 21-year history of increasing dividends although recent years have seen a decrease from their 5-year DAGR of ~11% to the low single digits. At the time of purchase, WPC was yielding 6.31% and my 15 shares will add $61.50 in forward dividend income. If you’re still with me after that flurry of purchases, you’ll have seen that these REITs (and honorary BDC) will add a whopping $1,077.60 in forward dividend income to my portfolio. When initially starting my DGI portfolio and setting my goals, I was hoping to achieve forward dividend income of $500 from REITs so I have clearly surpassed that goal. As mentioned earlier, due to the fact that I will not be able to add new capital to these investments, I decided to utilize the entire rollover to cover this sector and will continue to reinvest the dividends. 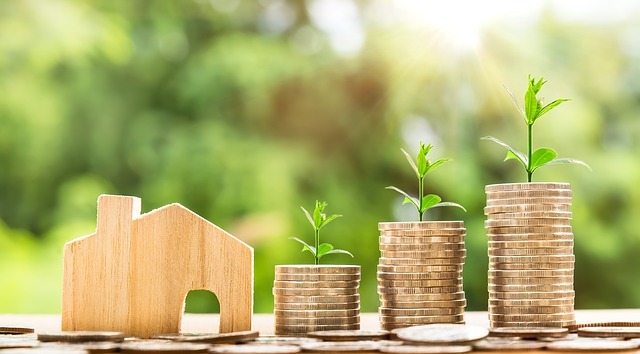 This mix of investments provides a dose of long-term blue chip REITs along with a few that carry a greater degree of risk albeit with a corresponding reward of a robust yield. When it comes to REITs, there is definitely a risk of chasing yield, however I believe I’ve done my best to avoid that trap. Thanks Tom, I had that same thought re: a mini sector fund here. You’re right that the tax-advantaged money is precious, and particularly so for me right now because other than my 401k contributions I am unable to continue adding new money into tax-advantaged accounts (I really need to start actively working on getting my tIRA into a Solo 401k to open the backdoor Roth). There definitely is risk with going all in on a sector like this with these funds, and I’ve tried to diversify within the sector based on different types of REITs but it is sound advice that you share. I will be taking that into consideration as part of my ongoing analysis of these holdings. I think you have chosen some excellent REIT’s which you will find in many other portfolio’s. Its extra cool for me to see you also adding IRM which I also have. It seems that the community at large has embraced IRM as a valuable option for REIT. The amount of total forward income you added with one buy is almost double that of my entire portfolio. Just sheer amazing work DD! Thanks Mr. Robot, to be fair these purchases were made with money that did not come out of my pocket / earnings. I’ve been a fan of IRM for awhile and have been biding my time for this rollover to process so that I could invest–I like what they are doing and some of their efforts to move to digital will set them up nicely in my opinion. Beyond these purchases, I haven’t been as active in my main DGI portfolio as I just haven’t been finding the right prices on my current holdings. Wow, DivvyDad! 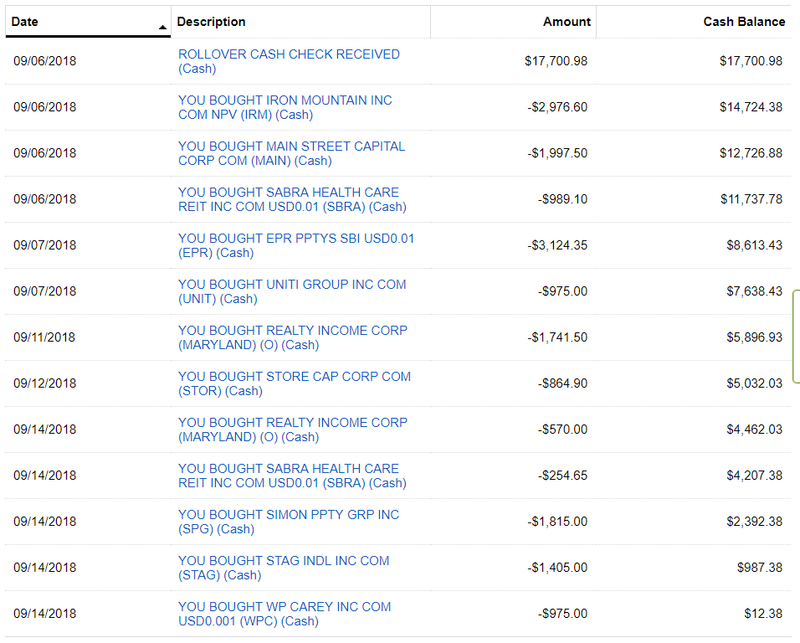 $1,077 in added dividend income is unbelievable! I own O and WPC, although I intend to add a few of the other names in the not so distant future. Thanks Kody, it was nice to be able to add that much in forward income. I’m closing in on $5k in forward income–which was going to be my goal for next year so I will clearly have to ratchet that up! Happy to hear that you currently own O and WPC too! Holy cow DivvyDad! That is some serious dividend income added right there! Congrats on the great purchases and I like the diversification of REIT sectors. Enjoy collecting those dividends ASAP! Bert and Lanny, thank you both! Yeah, with a few monthly dividend payers in this basket it won’t take long to start seeing some of the payments! I’m happy that this rollover has finally processed and I have been able to get that money to work! solid purchases dd. That is a tonne of added forward income. Got to love that! Thanks PCI, I am definitely looking forward to the boost in the monthly reports! That’s an impressive collection of REITs (and a BDC), DivvyDad. I like all your choices, and you do appear nicely diversified within the sector. Looks like a combined yield of about 6.09% if I’m not mistaken. Sweet! It will be nice to have some of the dividends start rolling in next month, too. Thanks ED, and I am definitely looking forward to having these divvy payments rolling in here in October. You’re not mistaken on the combined yield, and it has boosted up the yield of the overall portfolio to about 3.17% from the 2.75-2.80% I had been around.